Maybe An Early End To 'Carmageddon?' : The Two-Way A 10-mile section of heavily traveled I-405 in Los Angeles closes this evening and isn't scheduled to reopen until early Monday. But officials are cautiously optimistic that work will go well and traffic might be able to flow again a little earlier. 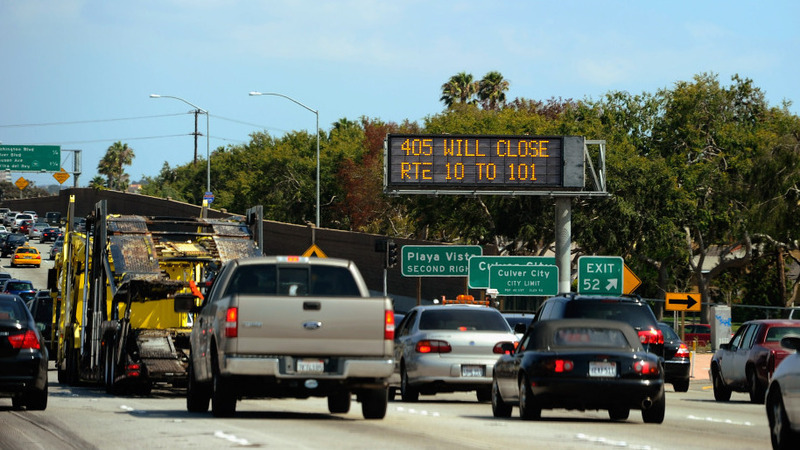 A traffic signs alerts motorists on Interstate 405 of the shutdown. If you're in Los Angeles this weekend and you try to drive anywhere near the 10-mile stretch of Interstate-405 that's closing tonight at 7 p.m. local time, don't say you weren't warned. From last month's appeal by authorities to celebs that they tweet their followers to stay away from the 405 this weekend to many, many reports about the "carmageddon" that could happen when the freeway shuts down so that a bridge can be demolished and widening work begin, there's certainly been lots of notice given. Today, there's a sliver of good news to add to the mix. The section of the 405 that's scheduled to be closed until 6 a.m. local time on Monday, "might reopen early," the Los Angeles Times reports. That's if — and this is a big if — "work on [demolishing] the Mulholland Drive bridge goes smoothly." As we wrote last month, there's lots of information, including maps about what's going to be happening on the website of the Los Angeles County Metropolitan Transportation Authority. Flying into Los Angeles this weekend? Los Angeles World Airports has tips for arriving passengers here. No. 1 suggestion: Don't have someone come to pick you up. Use public transportation. JetBlue, meanwhile, is offering $4-$5 flights from Long Beach Airport to Bob Hope Airport in Burbank.